It may or may not be obvious, but as editors, we see a lot of product day in and day out. The past month has been filled with meetings to preview the spring 2018 collections, and there was one particular trend that stood out among the rest. To be completely transparent with you (maybe this just applies to me), jewelry trends can be pretty tricky to spot, but after dozens of previews and a little research, it's safe to say that rainbow-stone jewelry will be a 2018 trend you'll see all over the place. Jewelry designers presented collections beaming with colorful stones and pavé carefully placed on rings, earrings, necklaces, and more. The best part of this festive trend is that it complements the dainty gold pieces we know you're so obsessed with. 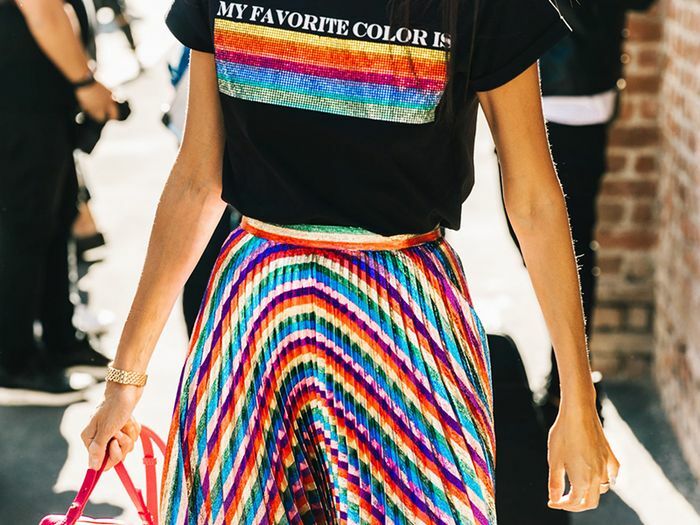 Don't worry—the word "rainbow" can sound a bit overwhelming, but the pieces are of course tasteful and delicate, the kind of jewelry items worth investing in. Go on to shop the new rainbow-stone jewelry trend we know will be huge in 2018. Looks like three rings in one. Precious doesn't even begin to cut it. Stack this with your other dainty gold ones. A cluster of something beautiful. This one's all in the name. Who wouldn't want an accent earring like this? These dainty earrings will be a conversation starter. Modern yet classic is always worth the investment. No, you're not misreading that approachable price point. Jewelry for your hair works too. Because you can never have too many stacking rings. For those eclectic souls out there. The fashion-girl brand everyone craves. Stack 'em high, stack 'em tall. The rose gold adds a special touch to this delicate ring. Rainbow gems on a rainbow shape. Tell time with a little more pizzazz. These plus that perfect LBD, and you have an exceptionally chic look. Pleasing to the eye and the heart. Piercing addicts will love these dainty studs. This necklace will do a white T-shirt wonders. Speaking of trends, shop the five trends you'll be able to wear for the next 50 years.